Hodgkin's disease is a rare lymphoma, a cancer of the lymphatic system. Hodgkin's disease, or Hodgkin's lymphoma, was first described in 1832 by Thomas Hodgkin, a British physician. Hodgkin clearly differentiated between this disease and the much more common non-Hodgkin's lymphomas. Prior to 1970, few individuals survived Hodgkin's disease. Now, however, the majority of individuals with this cancer can be cured. The lymphatic system is part of the body's immune system, for fighting disease, and a part of the blood-producing system. It includes the lymph vessels and nodes, and the spleen, bone marrow, and thymus. The narrow lymphatic vessels carry lymphatic fluid from throughout the body. The lymph nodes are small organs that filter the lymphatic fluid and trap foreign substances, including viruses, bacteria, and cancer cells. The spleen, in the upper left abdomen, removes old cells and debris from the blood. The bone marrow, the tissue inside the bones, produces new red and white blood cells. Lymphocytes are white blood cells that recognize and destroy disease-causing organisms. Lymphocytes are produced in the lymph nodes, spleen, and bone marrow. They circulate throughout the body in the blood and lymphatic fluid. Clusters of immune cells also exist in major organs. Hodgkin's disease is a type of lymphoma in which antibody-producing cells of the lymphatic system begin to grow abnormally. It usually begins in a lymph node and progresses slowly, in a fairly predictable way, spreading via the lymphatic vessels from one group of lymph nodes to the next. Sometimes it invades organs that are adjacent to the lymph nodes. If the cancer cells spread to the blood, the disease can reach almost any site in the body. Advanced cases of Hodgkin's disease may involve the spleen, liver, bone marrow, and lungs. The American Cancer Society estimates that there will be 7,400 new cases of Hodgkin's disease in the United States in 2001—3,500 in females and 3,900 in males. It is estimated that 700 men and 600 women in the United States will die of the disease in 2001. Hodgkin's disease can occur at any age. However, the majority of cases develop in early adulthood (ages 15-40) and late adulthood (after age 55). Approximately 10-15% of cases are in children under age 17. It is more common in boys than in girls under the age of 10. The disease is very rare in children under five. The cause of Hodgkin's disease is not known. It is suspected that some interaction between an individual's genetic makeup, environmental exposures, and infectious agents may be responsible. Immune system deficiencies also may be involved. As Hodgkin's disease progresses, the immune system becomes less effective at fighting infection. Thus, patients with Hodgkin's lymphoma become more susceptible to both common infections caused by bacteria and unusual (opportunistic) infections. Later symptoms of Hodgkin's disease include the formation of tumors. Significantly, as many as 75% of individuals with Hodgkin's disease do not have any typical symptoms. As with many forms of cancer, diagnosis of Hodgkin's disease has two major components. The initial diagnosis of Hodgkin's disease often results from abnormalities in a chest x ray that was performed because of nonspecific symptoms. The physician then takes a medical history to check for the presence of symptoms and conducts a complete physical examination. The size, tenderness, firmness, and location of swollen lymph nodes are determined and correlated with any signs of infection. In particular, lymph nodes that do not shrink after treatment with antibiotics may be a cause for concern. The lymph nodes that are most often affected by Hodgkin's disease include those of the neck, above the collarbone, under the arms, and in the chest above the diaphragm. Diagnosis of Hodgkin's disease requires either the removal of an entire enlarged lymph node (an excisional biopsy) or an incisional biopsy, in which only a small part of a large tumor is removed. If the node is near the skin, the biopsy is performed with a local anesthetic. However, if it is inside the chest or abdomen, general anesthesia is required. The sample of biopsied tissue is examined under a microscope. Giant cells called Reed-Sternberg cells must be present to confirm a diagnosis of Hodgkin's disease. These cells, which usually contain two or more nuclei, are named for the two pathologists who discovered them. Normal cells have only one nucleus (the organelle within the cell that contains the genetic material). Affected lymph nodes may contain only a few Reed-Sternberg cells and they may be difficult to recognize. Characteristics of other types of cells in the biopsied tissue help to diagnose the subtype of Hodgkin's disease. A fine needle aspiration (FNA) biopsy, in which a thin needle and syringe are used to remove a small amount of fluid and bits of tissue from a tumor, has the advantage of not requiring surgery. An FNA may be performed prior to an excisional or incisional biopsy, to check for infection or for the spread of cancer from another organ. However an FNA biopsy does not provide enough tissue to diagnose Hodgkin's disease. Occasionally, additional biopsies are required to diagnose Hodgkin's disease. In rare instances, other tests, that detect certain substances on the surfaces of cancer cells or changes in the DNA of cells, are used to distinguish Hodgkin's disease from non-Hodgkin's lymphoma. Staging is very important in Hodgkin's disease. This is because the cancer usually spreads in a predictable pattern, without skipping sets of lymph nodes until late in the progression of the disease. Imaging of the abdomen, chest, and pelvis is used to identify areas of enlarged lymph nodes and abnormalities in the spleen or other organs. Computerized axial tomography (CT or CAT) scans use a rotating x-ray beam to obtain pictures. Magnetic resonance imaging (MRI) uses magnetic fields and radio waves to produce images of the body. Chest x rays also may be taken. These images will reveal rounded lumps called nodules in the affected lymph nodes and other organs. Another imaging technique for Hodgkin's disease is a gallium scan, in which the radioactive element gallium is injected into a vein. The cancer cells take up the gallium and a special camera that detects the gallium is used to determine the location and size of tumors. Gallium scans are used when Hodgkin's disease is in the chest and may be hard to detect by other methods. Gallium scans also are used to monitor progress during treatment. A lymphangiogram, a radiograph of the lymphatic vessels, involves injecting a dye into a lymphatic vessel in the foot. Tracking of the dye locates the disease in the abdomen and pelvis. This method is used less frequently and is usually not used with children. Positron emission tomography (PET) scans are an extremely accurate method for staging Hodgkin's disease. A very low dose of radioactive glucose, a sugar, is injected into the body. The glucose travels to metabolically active sites, including cancerous regions that require large amounts of glucose. The PET scan detects the radioactivity and produces images of the entire body that distinguish between cancerous and non-cancerous tissues. Anemia (a low red-blood-cell count), fevers, or night sweats are indications that Hodgkin's disease may be in the bone marrow. In these cases, a bone-marrow biopsy, in which a large needle is used to remove a narrow, cylindrical piece of bone, may be necessary to determine the spread of the cancer. Alternatively, an aspiration, in which a needle is used to remove small bits of bone marrow, may be used. The marrow usually is removed from the back of the hip or other large bone. Sometimes further staging, called pathological staging or a staging laparotomy, is used for Hodgkin's disease. In this operation, a surgeon checks the abdominal lymph nodes and other organs for cancer and removes small pieces of tissue. A pathologist examines the tissue samples for Hodgkin's disease cells. Usually the spleen is removed (a splenectomy) during the laparotomy. The splenectomy helps with staging Hodgkin's disease, as well as removing a disease site. All of the available treatments for Hodgkin's disease have serious side effects, both short and long-term. However, with accurate staging, physicians and patients often can choose the minimum treatment that will cure the disease. The staging system for Hodgkin's disease is the Ann Arbor Staging Classification, also called the Cotswold System or the Revised Ann Arbor System. Radiation therapy and/or chemotherapy (drug therapy) are the standard treatments for Hodgkin's disease. If the disease is confined to one area of the body, radiotherapy is usually used. This treatment, with x rays or other high-energy rays, also is used when the disease is in bulky areas such as the chest, where chemotherapeutic drugs cannot reach all of the cancer. External-beam radiation, a focused beam from an external machine, is used to irradiate only the affected lymph nodes. This procedure is called involved field radiation. More advanced stages of Hodgkin's disease may be treated with mantle field radiation, in which the lymph nodes of the neck, chest, and underarms are irradiated. Inverted Y field radiation is used to irradiate the spleen and the lymph nodes in the upper abdomen and pelvis. Total nodal irradiation includes both mantle field and inverted Y field radiation. Since external-beam radiation damages healthy tissue near the cancer cells, the temporary side effects of radiotherapy can include sunburn-like skin damage, fatigue, nausea, and diarrhea. Other temporary side effects may include a sore throat and difficulty swallowing. Long-term side effects depend on the dose and the location of the radiation and the age of the patient. Since radiation of the ovaries causes permanent sterility (the inability to have offspring), the ovaries of girls and young women are protected during radiotherapy. Sometimes the ovaries are surgically moved from the region to be irradiated. If the Hodgkin's disease has progressed to additional lymph nodes or other organs, or if there is a recurrence of the disease within two years of radiation treatment, chemotherapy is used. Chemotherapy utilizes a combination of drugs, each of which kills cancer cells in a different way. The most common chemotherapy regimens for Hodgkin's disease are MOPP (either mechlorethamine or methotrexate with Oncovin, procarbazine, prednisone) and ABVD (Adriamycin or doxorubicin, bleomycin, vincristine, dacarbazine). Each of these consists of four different drugs. ABVD is used more frequently than MOPP because it has fewer severe side effects. However MOPP is used for individuals who are at risk for heart failure. The chemotherapeutic drugs may be injected into a vein or muscle, or taken orally, as a pill or liquid. Children who are sexually mature when they develop Hodgkin's disease, and whose muscle and bone mass are almost completely developed, usually receive the same treatment as adults. Younger children usually are treated with chemotherapy, since radiation will adversely affect bone and muscle growth. However, radiation may be used in low dosages, in combination with chemotherapy. The chemotherapy for children with Hodgkin's disease usually includes more drugs than ABVD and MOPP. The side effects of chemotherapy for Hodgkin's disease depend on the dose of drugs and the length of time they are taken. Since these drugs target rapidly dividing cancer cells, they also affect normal cells that grow rapidly. These include the cells of the bone marrow, the linings of the mouth and intestines, and hair follicles. Damage to bone marrow leads to lower white blood cell counts and lower resistance to infection. It also leads to lower red blood cell counts, which can result in fatigue and easy bleeding and bruising. Damage to intestinal cells leads to a loss of appetite, nausea, and vomiting. Mouth sores and hair loss also are common side effects of chemotherapy. These side effects disappear when the chemotherapy is discontinued. Some drugs can reduce or prevent the nausea and vomiting. Chemotherapy for Hodgkin's disease may lead to long-term complications. The drugs may damage the heart, lungs, kidneys, and liver. In children, growth may be impeded. Some chemotherapy can cause sterility, so men may choose to have their sperm frozen prior to treatment. Women may stop ovulating and menstruating during chemotherapy. This may or may not be permanent. Treatment for higher-stage Hodgkin's disease often involves a combination of radiotherapy and chemotherapy. Following three or four chemotherapy regimens, involved field radiation may be directed at the most affected areas of the body. The long-term side effects often are more severe when radiation and chemotherapy are used in combination. The development of a second type of cancer is the most serious risk from radiation and chemotherapy treatment for Hodgkin's disease. In particular, there is a risk of developing leukemia, breast cancer, bone cancer, or thyroid cancer. Chemotherapy, particularly MOPP, or chemotherapy in conjunction with radiotherapy, significantly increases the risk for leukemia. Following treatment, the original diagnostic tests for Hodgkin's disease are repeated, to determine whether all traces of the cancer have been eliminated and to check for long-term side effects of treatment. In resistant Hodgkin's disease, some cancer cells remain following treatment. If the cancer continues to spread during treatment, it is called progressive Hodgkin's disease. If the disease returns after treatment, it is known as recurrent Hodgkin's disease. It may recur in the area where it first started or elsewhere in the body. It may recur immediately after treatment or many years later. Additional treatment is necessary with these types of Hodgkin's disease. If the initial treatment was radiation therapy alone, chemotherapy may be used, or vice versa. Chemotherapy with different drugs, or higher doses, may be used to treat recurrent Hodgkin's. However, radiation to the same area is never repeated. An autologous bone marrow and/or a peripheral blood stem cell transplantation (PBSCT) often is recommended for treating resistant or recurrent Hodgkin's disease, particularly if the disease recurs within a few months of a chemotherapy-induced remission. These transplants are autologous because they utilize the individual's own cells. The patient's bone marrow cells or peripheral blood stem cells (immature bone marrow cells found in the blood) are collected and frozen prior to high-dosage chemotherapy, which destroys bone marrow cells. A procedure called leukapheresis is used to collect the stem cells. Following the high-dosage chemotherapy, and possibly radiation, the bone marrow cells or stem cells are reinjected into the individual. Most complementary therapies for Hodgkin's disease are designed to stimulate the immune system to destroy cancer cells and repair normal cells that have been damaged by treatment. These therapies are used in conjunction with standard treatment. Immunologic therapies, also known as immunotherapies, biological therapies, or biological response modifier therapies, utilize substances that are produced by the immune system. These include interferon (an immune system protein), monoclonal antibodies (specially engineered antibodies), colony-stimulating (growth) factors (such as filgrastim), and vaccines. Many immunotherapies for Hodgkin's disease are experimental and available only through clinical trials. These biological agents may have side effects. Coenzyme Q10 (CoQ10) and polysaccharide K (PSK) are being evaluated for their ability to stimulate the immune system and protect healthy tissue, as well as possible anti-cancer activities. Camphor, also known as 714-X, green tea, and hoxsey (which is a mixture of a number of substances), have been promoted as immune system enhancers. However there is no evidence that they are effective against Hodgkin's disease. Hoxsey, in particular, can produce serious side effects. Hodgkin's disease, particularly in children, is one of the most curable forms of cancer. Approximately 90% of individuals are cured of the disease with chemotherapy and/or radiation. The one-year relative survival rate following treatment for Hodgkin's disease is 93%. Relative survival rates do not include individuals who die of causes other than Hodgkin's disease. The percentage of individuals who have not died of Hodgkin's disease within five years of diagnosis is 90-95% for those with stage I or stage II disease. The figure is 85-90% for those diagnosed with stage III Hodgkin's and approximately 80% for those diagnosed with stage IV disease. The 15-year relative survival rate is 63%. Approximately 75% of children are alive and cancer free 20 years after the original diagnosis of Hodgkin's. Acute myelocytic leukemia, a very serious cancer, may develop in as many as 2-6% of individuals receiving certain types of treatment for Hodgkin's disease. Women under the age of 30 who are treated with radiation to the chest have a much higher risk for developing breast cancer. Both men and women are at higher risk for developing lung or thyroid cancers as a result of chest irradiation. Individuals with the type of Hodgkin's disease known as nodular lymphocytic predominance have a 2% chance of developing non-Hodgkin's lymphoma. Apparently, this is a result of the Hodgkin's disease itself and not the treatment. Signs and Symptoms. The first sign of the disease usually is an enlargement of lymph nodes in the cervical, axillary, or inguinal chains. Severe itching is often an early symptom of the disorder; signs may also include fever, night sweats, and weight loss of greater than 10 per cent. As Hodgkin's disease progresses, it spreads through the lymphatic system, involving other lymph nodes elsewhere in the body as well as the spleen, liver, and bone marrow. The lymph nodes and the spleen and liver may swell, and by obstructing other organs may cause coughing, breathlessness, or enlargement of the abdomen. The patient often becomes neutropenic, thrombocytopenic, or anemic and because of blood changes the body becomes less able to combat infections. There are several different staging systems, classifying the disease according to stages of development of malignancy; the stages are helpful in establishing the prognosis and prescribing treatment. The most commonly used is the Cotswold or Modified Ann Arbor Staging System. 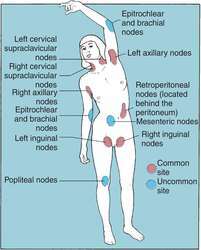 In Stage I only one localized lymph node region is involved. Stage IE indicates involvement of a single extralymphatic organ. Stage II indicates two or more involved nodes on the same side of the diaphragm. Stage IIE indicates involvement of an extralymphatic organ and one or more nodes on the same side of the diaphragm. IIS designates splenic involvement with localization below the diaphragm. In Stage III there is disease on both sides of the diaphragm, sometimes with splenic involvement (IIIS) or extralymphatic organ involvement (IIIE), or both (IIISE). In Stage IV there is diffuse involvement of one or more extralymphatic organs or tissues with or without associated lymph node involvement. The presence or absence of systemic manifestations should be indicated by adding the letter A or B to the stage number, where A indicates asymptomatic and B indicates fever, night sweats, and weight loss of more than 10 per cent of body weight. Diagnosis. The diagnosis of Hodgkin's disease requires the histologic identification of the characteristic malignant cell of the disease, the Reed-Sternberg cell. The accepted histopathologic classification distinguishes four different disease patterns: lymphocyte predominance, mixed cellularity, lymphocyte depletion, and nodular sclerosis. The evaluation required for staging includes a history and physical examination; CT scans of the chest, abdomen, and pelvis; laboratory tests, including a complete blood count, serum alkaline phosphatase, and liver and kidney function tests; and sometimes gallium scanning or lymphangiography; and a surgical lymph node biopsy. Osseous involvement is evaluated with bone marrow biopsy and bone scans. The evaluation of abdominal involvement may require exploratory laparotomy or splenotomy. Treatment and Care. If the disease is localized (Stages IA, IIA, or IIIA), the treatment of choice is radiation therapy capable of delivering a high dose of radiation deep into the tissues. chemotherapy is recommended for patients with systemic involvement (Stages IB, IIB, and IIIB). The chemotherapeutic agents are administered in combination and intermittently so that there is a synergistic cytotoxic effect without overlapping toxicities. Drugs are chosen according to their effect on different phases of cell growth and proliferation. (See also antineoplastic therapy.) Often it is decided to employ both chemotherapy and radiation therapy, especially in treating bulky tumor involvement of nodes and spleen. After recovery, follow-up care is extremely important. There is an increased risk of developing other cancers later in life. Staging of Hodgkin's disease. From Damjanov, 1996.
a malignant disorder characterized by painless, progressive enlargement of lymphoid tissue, usually first evident in cervical lymph nodes; splenomegaly; and the presence of Reed-Sternberg cells, large binucleate CD20 (B cell marker)-positive lymphoid/histiocytic cells. Symptoms include anorexia, weight loss, generalized pruritus, low-grade fever, night sweats, anemia, and leukocytosis. The disease is diagnosed in about 7100 Americans annually and causes approximately 1700 deaths a year, affects twice as many males as females, and most often occurs in individuals 25 to 30 years of age and older than 50 years of age. The diagnosis is established by biopsy. The patient undergoes staging to determine the extent of the disease, including computed tomography of the chest and abdomen, complete blood count, biopsy of distant lymph nodes, liver function studies, and bilateral bone marrow biopsies. Radiotherapy, using a covering mantle to protect other organs, is the treatment of choice for early stages of the disease; combination chemotherapy is the treatment for advanced disease. Long-term remissions are achieved in more than half of the patients treated, and 60% to 90% of those with localized disease may be cured. There is a threefold increased risk of development of Hodgkin's disease in first-degree relatives, suggesting an unknown genetic mechanism. Hodgkin's lymphoma Hematology A type of lymphoma most common in young adults, accounting for ± 0.7% of all new cancers in the US–±7500 cases; HD is clinically distinct as it often responds well to chemotherapy, and histologically distinct as its sine qua non diagnosis requires Reed-Sternberg cells Clinical Asymptomatic enlargement of lymph nodes, spleen, or other lymphoid tissue, ±fever, weight loss, fatigue, night sweats Staging Ann Arbor classification Treatment RT, MOPP, mechlorethamine, vincristine, procarbazine, prednisone; 20% are treatment 'failures' and may respond to various cocktails–eg, ABVD–doxorubicin, bleomycin, vinblastine, dacarbazine, salvage therapy, third line therapy. See Ann Arbor classification, Reed-Sternberg cell. a primary lymph node neoplastic disease of humans. Rarely in animals, mainly dogs, do lymphoid neoplasms satisfy the criteria, e.g. Reed-Sternberg cells, for diagnosis as Hodgkin's lymphoma. Review of British National Lymphoma Investigation studies of Hodgkin's disease and development of prognostic index. Preclinical studies show that SGN-70 selectively targets CD70 and induces effector cell-mediated antitumor activity, extending survival in animal models of multiple myeloma, Hodgkin's disease and non-Hodgkin's lymphoma (abstract 2492). 3 -- color) 18-year-old Johnny Carrasco died of Hodgkin's disease in August. The lymphomas are divided into two major categories: Hodgkin's disease and all other lymphomas, or non-Hodgkin's lymphomas. Like many people diagnosed with Hodgkin's disease, Miller's prognosis is good. It was May, and the Saugus High basketball coach was in the midst of treatment for Hodgkin's disease. In 2007, the company expects to initiate clinical studies of a proprietary antibody compound, XmAb[TM]2513, for Hodgkin's disease. 22 of complications from the aggressive treatment of an advanced case of Hodgkin's disease, Krogstad said. Hodgkin's disease is one type of lymphoma; other lymphomas are grouped together as non-Hodgkin's lymphoma. to publish ``The Jester Has Lost His Jingle,'' after the writer died of Hodgkin's disease shortly before his 23rd birthday seven years ago.